Info This is an popular coil geometri used in todays wireless charger circuits. for air core flat spiral coil inductor. 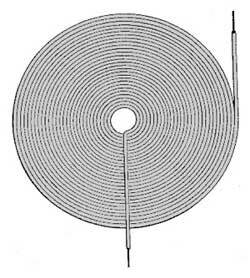 Di = inner diameter in inches. 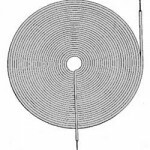 Please note that the outer and inner diameter is measured from the center of the wire. applications and designed as tracks on a circuit board. An “air core inductor” is an inductor that does not depend upon a ferromagnetic material to achieve its specified inductance. Some inductors are wound without a bobbin and just air as the core. Some others are wound on a bobbin made of bakelite, platsic, ceramic etc. Air coils are also free of the “iron losses” which a problem with ferromagnetic cores. As frequency is increased this advantage becomes progressively more important. You obtain better Q-factor, greater efficiency, greater power handling, and less distortion. Without a high permeability core you must have more and/or larger turns to achieve a given inductance value. More turns means larger coils, lower self-resonance dur to higher interwinding capacitance and higher copper loss. At higher frequencies you generally don’t need high inductance, so this is then less of a problem. You may be using an air cored coil not because you require a circuit element with a specific inductance per se but because your coil is used as a proximity sensor, loop antenna, induction heater, Tesla coil, electromagnet, magnetometer head, or deflection yoke etc. Then an external radiated field may be what you want.